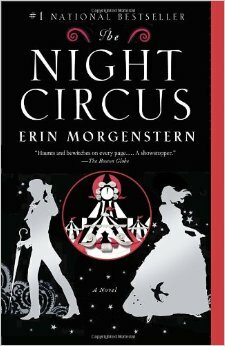 I didn’t know that a book could be completely vague and painfully detailed at the same time, but such is the case with The Night Circus by Erin Morgenstern. The hook is just vague enough – The circus arrives without warning. No announcements precede it. It is simply there, when yesterday it was not. Why wouldn’t you want to read this? With its spectacular cover design and chimera, it feels like magic in your hands. And it is, sort of. Celia and Marco are bound in childhood to be opponents and the circus is their arena. Set in Victorian time, these two are groomed for a duel they know little about. Their handlers are non-specific with information or they simply ignore the opponents’ questions. Celia and Marco don’t officially meet until adulthood, and even then, they don’t know they are to be one another’s opponent until they’ve already started having feelings for each other. Cue Romeo and Juliet. The lovers cannot be together because they just can’t. Competition aside, Morgenstern creates a spectacular scene with her fantasy circus. Going into the book I expected it to be all illusion, hints and whiffs of magic but knowing it was all a trick. This isn’t the case with The Night Circus, for it is indeed other worldly. It is a complete fantasy, with its manipulation of time and space, its physical distortions, and the way in which one person controls everything. I feel it’s important for you to know this in case reading fantasy fiction isn’t your thing. It’s not really my thing, so I spent much of the book saying, “That couldn’t happen” or “That’s not real.” Of course it’s not real. It’s fantasy. If you can suspend your disbelief and recreate Morgenstern’s circus in your head, then the narrative is a delight. She created the kind of show we all wanted to see when we were kids. It’s rumored that The Night Circus will be a movie, and if that’s true, I’ll definitely see it because this is the sort of story that requires a visual. There is no big top, no lion tamers, no clowns. Instead there are a menagerie of black-and-white-striped tents that show up in the middle of the night and they’re all begging you to take a peek inside… and believe. Buy The Night Circus here.